What is the City Center Master Plan? The last Birmingham City Center Master Plan Update was completed in 2004. Since then, the City Center has come a long way in a short period of time and grows stronger and more vibrant with investments large and small—from Railroad Park and Regions Field to mixed-use developments in Parkside to renovations of historic buildings like the Pizitz and the Empire buildings. Committed public and private partners and a few strategic investments have had a stunning, transformative impact on downtown Birmingham over the last two decades. Given this progress it is an opportune time to develop a new Birmingham City Center Master Plan to complement the city center’s revitalization efforts and help residents, workers and visitors to experience all that downtown Birmingham has to offer. The City Center Master Plan boundary is outlined in the study area map to the right. It is generally bounded by I-65 to the west and U.S. 31 / Elton B. Stephens Expressway to the east. The northern boundary includes the Birmingham Jefferson Civic Center, Uptown District and 11th and 12th Avenues North. The southern boundary encompasses the University of Alabama at Birmingham (UAB) campus, Five Points South and the St. Vincent’s Hospital campus. Two areas extend beyond the U.S. 31 / Elton B. Stephens Expressway to the east: the Sloss Furnaces Historic Site and the Lakeview District. The western boundary includes the former Trinity Steel site (27 acres), which extends beyond I-65 near UAB. 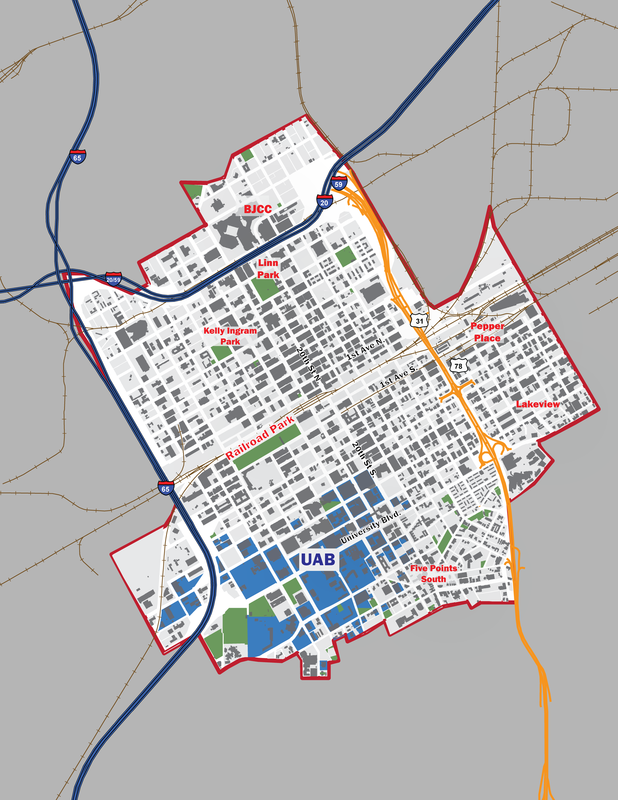 The Birmingham City Center Master Plan will be comprehensive in scope incorporating elements of land use, zoning, urban design, parking, and strategic planning into a coordinated vision and implementation program that will identify short, medium and long term projects for public and private investment in the City Center for the next 10-15 years. The plan will be guided by a detailed market analysis that will examine retail, residential, office and industrial trends and will establish future market demand. The plan will also focus on furthering the development of the sub-districts within the heart of the City Center, such as the Birmingham Civil Rights District, the Innovation District, and the Local Historic Districts, and will address potential new redevelopment areas. This Master Plan is a cooperative effort between the City of Birmingham , the Regional Planning Commission of Greater Birmingham (RPCGB) and REV Birmingham, under contract with the Stantec Urban Places Team. Sub-consultants to the Stantec team include: W-ZHA, Zimmerman / Volk Associates, the KPS Group and Studio 2H Design. The City Center Master Plan is being funded through the Building Communities Program. The program is administered through the Regional Planning Commission of Greater Birmingham, who provides federal funding for 80% of the project cost and the City of Birmingham provides the local government match of 20% of the project cost. Read more about the Building Communities Program ​here. Proper downtown development requires a tremendous amount of staff technical capacity, deal-making savvy, community support and political will to execute well. To add an extra layer of difficulty, downtown development is very visible, which means these projects entail more political risk and require bolder (and more informed) leadership from public officials "
The City Center Study Area is comprised of approximately 2,550 acres (or 3.98 square miles). Click on the map below to view or download it. What's my role in the Process? During the course of the planning process residents, business owners, landowners, and others can actively participate in the planning process by sharing their vision for growth. Think about what areas of downtown you want to become more walkable or more vibrant? What sort of businesses or public services would you like to see. Where do you want bike lanes or improved sidewalks? What areas just need a facelift? What are downtown's biggest assets? We need to hear all of this from you.